Worst American Rail Project Ever? Last week I was in Albuquerque several hours early for my meeting in Santa Fe. Several years ago I had written about the Railrunner passenger rail line that operates from south of Albuquerque north to Santa Fe. Our Arizona Republic had written a relentlessly positive article about the line, focusing on how much the people who rode on it loved it. Given that the picture they included in the article showed a young woman riding in a nearly empty car, I suspected that while the trains themselves might be nice for riders, the service probably wasn't a very good deal for taxpayers. Of course, as is typical, the Republic article had absolutely no information on costs or revenues, as for some reason the media has adopted an attitude that such things don't matter for rail projects -- all that matters is finding a few people to interview who "like it." So I attempted to run some numbers based on some guesses from other similar rail lines, and made an educated guess that it had revenues of about $1.8 million and operating costs of at least $20 million, excluding capital charges. I got a lot of grief for making up numbers -- surely it could not be that bad. Hang on for a few paragraphs, because we are going to see that its actually worse. Anyway, I was in Albuquerque and thought I would ride the train to Santa Fe. I had meetings at some government offices there, and it turns out that the government officials who spent the state's money on this project were careful to make sure the train stopped outside of their own workplaces. I posited in my original article that every rider's trip was about 90% subsidized by New Mexico taxpayers, so I might as well get my subsidy. Well, it turned out I missed my chance. Apparently, trains do not run during much of the day, and all I saw between 9:30AM and 4:00 PM was trains just parked on the tracks. I thought maybe it was a holiday thing because it was President's Day but their web site said it was a regular schedule. I caught the shot below of one of the trains sitting at the Santa Fe station. Anyway, I got interested in checking back on the line to see how it was doing. I actually respected them somewhat for not running mid-day trains that would lose money, but my guess is that only running a few trains a day made the initial capital costs of the line unsustainable. After all, high fixed cost projects like rail require that one run the hell out of them to cover the original capital costs. 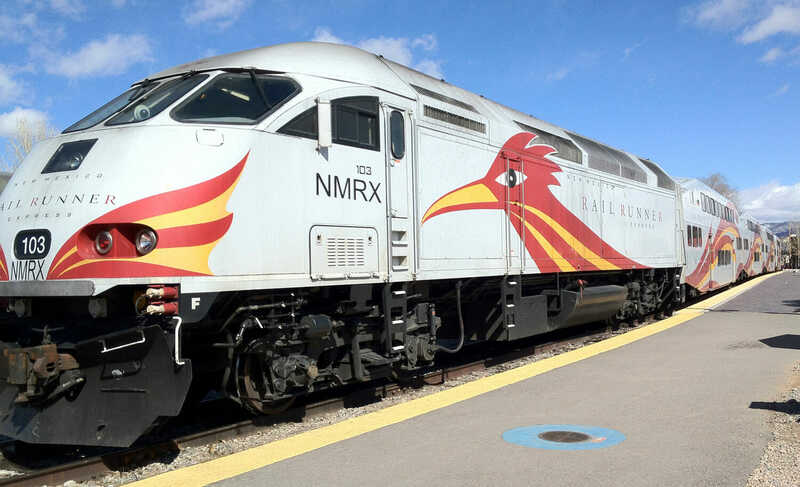 New Mexico Rail Runner Express officials said Wednesday the railroad will receive an additional $4.8âmillion in federal funding this year that puts the operating budget more than $4âmillion in the black. The injection of new money boosts Rail Runnerâs revenues this year to $28âmillion, well in excess of expected operating costs of $23.6âmillion, said Terry Doyle, transportation director of the Mid Region Council of Governments, which oversees Rail Runner. The announcement comes as state lawmakers debate a measure that would require counties with access to the Belen-to-Santa Fe passenger railroad to pay for any deficit in Rail Runnerâs operations with local taxes. Currently, almost half its revenues, $13âmillion, comes from local sales taxes. The Rail Runner collects about $3.2âmillion a year in fares and has an annual operating budget of about $23.6âmillion. That does not include about $41.7âmillion a year in debt service on the bonds â a figure that include eventual balloon payments. So it turns out that I was actually pretty close, particularly since my guess was four years ago and they have had some ridership increases and fare increases since. At the end of the day, riders are paying $3.2 million of the total $65.3 million annual cost. Again, I repeat my reaction from four years ago to hearing that riders really loved the train. Of course they do -- taxpayers (read: non-riders) are subsidizing 95.1% of the service they get. I wonder if they paid the full cost of the train ride -- ie if their ticket prices were increased 20x -- how they would feel about the service? Of course, the Railrunner folks are right on the case. They have just raised prices, which "could" generate $600,000 in extra revenue, assuming there is no loss in ridership from the fare increases (meaning assuming the laws of supply and demand do no operate correctly). If this fare increase is as successful as planned, they will have boldly reduced the public subsidy to just 94.2% of the cost of each trip. By the way, it is interesting to note in this Wikipedia article (Wikipedia articles on government rail projects generally read like press releases) that ridership on this line dropped by over half when the service went from free to paid (ie when the government subsidy dropped from 100% to 95%). The line carries around 2000 round-trip passengers (ie number of boarding divided by two) a day. It is simply incredible that a state can directly lavish $60 million a year in taxpayer money on just 2000 mostly middle class citizens. That equates to a subsidy of $30,000 per rider per year, enough to buy every daily round trip rider a new Prius and the gas to run it every single year. Postscript: This person seems to get it. One thing I had not realized, the trip from Albuquerque to Santa Fe that I did in my rental car in 60 minutes takes 90 minutes by "high-speed rail".